University of Science and Technology of China, 1994. Our laboratory is interested in studying molecular mechanisms involved in cytokine receptor signaling in hematopoiesis, hematopoietic stem cell development, and leukemogenesis. Our lab focuses on molecular hematology-oncology with an emphasis on studying signal transduction in normal blood cell development and hematological malignancies. We use genetically-engineered mouse models, bone marrow transplantation, tissue culture cells, gene transcriptional profiling, protein complex purification and mass spectrometric identification, coupled with extensive usage of molecular, cellular, and biochemical technologies. Hundreds of billions of blood cells have to be replenished everyday. Cytokines and cytokine receptors play important roles in blood cell formation, a process known as hematopoiesis. The amplitude and duration of cytokine receptor signaling is a highly regulated process that is crucial for cytokine- governed hematopoiesis. Dysregulation of these complex signaling networks can predispose to myeloproliferative diseases and myeloid leukemia. 3. Undertaking studies to identify novel signaling components in the receptor/JAK2 signaling complex that lead to oncogenic transformation, as JAK2 is the central kinase governing many cytokine receptor signaling, and has been found mutated in some patients with myeloproliferative diseases. 4. Understanding ubiquitination and de-ubiquitination in regulation of cytokine signaling and hematopoietic stem cell expansion. 5. Investigating cytokine signaling in Acute Lymphoblastic Leukemia. Potential projects can be discussed with Dr. Tong. 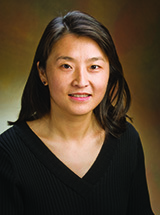 Balcerek Joanna, Jiang Jing, Li Yang, Jiang Qinqin, Holdreith Nicholas, Singh Brijendra, Chandra Vemika, Lv Kaosheng, Ren Jian-Gang, Rozenova Krasimira, Li Weihua, Greenberg Roger A, Tong Wei: Lnk/Sh2b3 deficiency restores hematopoietic stem cell function and genome integrity in Fancd2 deficient Fanconi anemia. Nature communications 9(1): 3915, Sep 2018. Lv Kaosheng, Jiang Jing, Donaghy Ryan, Riling Christopher R, Cheng Ying, Chandra Vemika, Rozenova Krasimira, An Wei, Mohapatra Bhopal C, Goetz Benjamin T, Pillai Vinodh, Han Xu, Todd Emily A, Jeschke Grace R, Langdon Wallace Y, Kumar Suresh, Hexner Elizabeth O, Band Hamid, Tong Wei: CBL family E3 ubiquitin ligases control JAK2 ubiquitination and stability in hematopoietic stem cells and myeloid malignancies. Genes & development 31(10): 1007-1023, 05 2017. Giani Felix C, Fiorini Claudia, Wakabayashi Aoi, Ludwig Leif S, Salem Rany M, Jobaliya Chintan D, Regan Stephanie N, Ulirsch Jacob C, Liang Ge, Steinberg-Shemer Orna, Guo Michael H, Esko Tõnu, Tong Wei, Brugnara Carlo, Hirschhorn Joel N, Weiss Mitchell J, Zon Leonard I, Chou Stella T, French Deborah L, Musunuru Kiran, Sankaran Vijay G: Targeted Application of Human Genetic Variation Can Improve Red Blood Cell Production from Stem Cells. Cell stem cell 18(1): 73-8, Jan 2016. Cheng Ying, Chikwava Kudakwashe, Wu Chao, Zhang Haibing, Bhagat Anchit, Pei Dehua, Choi John K, Tong Wei: LNK/SH2B3 regulates IL-7 receptor signaling in normal and malignant B-progenitors. The Journal of clinical investigation 126(4): 1267-81, Apr 2016. Jiang Qinqin, Paramasivam Manikandan, Aressy Bernadette, Wu Junmin, Bellani Marina, Tong Wei, Seidman Michael M, Greenberg Roger A: MERIT40 cooperates with BRCA2 to resolve DNA interstrand cross-links. Genes & development 29(18): 1955-68, Sep 2015. Rozenova Krasimira, Jiang Jing, Donaghy Ryan, Aressy Bernadette, Greenberg Roger A, Tong Wei: MERIT40 deficiency expands hematopoietic stem cell pools by regulating thrombopoietin receptor signaling. Blood 125(11): 1730-8, Mar 2015. Jiang Jing, Balcerek Joanna, Rozenova Krasimira, Cheng Ying, Bersenev Alexey, Wu Chao, Song Yiwen, Tong Wei: 14-3-3 regulates the LNK/JAK2 pathway in mouse hematopoietic stem and progenitor cells. The Journal of clinical investigation 122(6): 2079-91, Jun 2012. Bersenev Alexey, Wu Chao, Balcerek Joanna, Jing Jiang, Kundu Mondira, Blobel Gerd A, Chikwava Kudakwashe R, Tong Wei: Lnk constrains myeloproliferative diseases in mice. The Journal of clinical investigation 120(6): 2058-69, Jun 2010. Scott Linda M, Tong Wei, Levine Ross L, Scott Mike A, Beer Philip A, Stratton Michael R, Futreal P Andrew, Erber Wendy N, McMullin Mary Frances, Harrison Claire N, Warren Alan J, Gilliland D Gary, Lodish Harvey F, Green Anthony R: JAK2 exon 12 mutations in polycythemia vera and idiopathic erythrocytosis. The New England journal of medicine 356(5): 459-68, Feb 2007. Bersenev Alexey, Wu Chao, Balcerek Joanna, Tong Wei: Lnk controls mouse hematopoietic stem cell self-renewal and quiescence through direct interactions with JAK2. The Journal of clinical investigation 118(8): 2832-44, Aug 2008.